Those would be more useful in trapping lint than anything. Oh Joanne, I meant ANYTHING but good. :) Grossss. So Jasmine, you wouldn't allow the owner to make you a sandwich then? Think of all the crunchy bits. Chazza, good for taking dead skin off your feet but other than that, disaster. Planning on getting into silk-weaving? Some silk workers in China used to file notches like these into their fingernails, using their nails like combs to straighten & gather together the silk fibers. Oh lord, what if you're eye begins to itch?!!!! It would be fantastic to have a back scratch from those nails. Looks like a sure cure for nose-picking. I have actually seen pictures of something a little less extreme on a mans hand from china that specialized in hand silk weaving. He would use the notches in his nails to separate the fine threads to weave very intricate patterns in the silk. Anon (19th Jan) yes they call this person the human loom! Anon (00:34) Haha! I like your style...where's Pac-Man? Sommelier, it would be handy for work but everything else must be ouch. Carlb, it's guaranteed you'll be cured in less than a day. Anon (13:58) a painstaking job I'm sure. Visited a rug-making factory in Turkey last year, some of them take years to finish. it looks good, my sister is a manicurist. It is amazing what she can do with the nails. I didn't know but now. It is popular to do a draw in only one nail per hand. 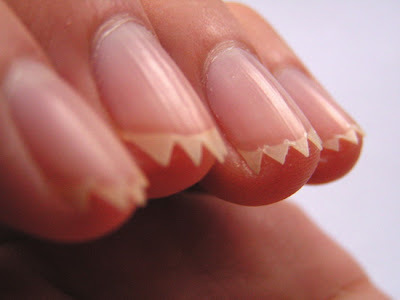 Serrating your nails is a terrible idea! One split and it will run right up the nail, then you'll know pain. Can You Say "Incapacity Benefit Fraud"